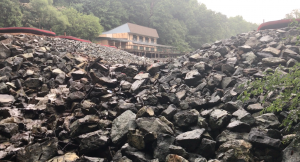 As you may have observed, Broomall’s Dam has been partially removed by the DEP as planned. The bulk of this work was completed in mid-July. The area of Broomall’s Lake has resettled and is now a meadow with a free-flowing stream running through it. We have observed deer grazing as well as other wildlife. Due to the lack of rain as well as the change in hydrology, Broomall’s Run, as it passes through Glen Providence Park, appears to have a much lower flow. A great deal of sediment from the lake has also been deposited in the stream and probably in the pond. We are watching closely and consulting with experts to learn about the short and long term impacts on the stream and the pond. To the best of our knowledge, plans for construction of the dam and two way road continue with Media Borough as the project manager and is slated to begin in late 2018. We are not aware of either Delaware County or Broomall’s Lake Country Club (BLCC) agreeing to be owner — a requirement for DEP permit. Friends of Glen Providence Park continues to advocate for full stream restoration and an environmentally sensitive bridge across Broomall’s Run that addresses the community’s transportation needs. BLCC leadership is strongly opposed to this zoning change, expressing their desire to retain the right to develop their land, which they estimate to be worth more than 12 million dollars if developed into 17 townhouses, as stated in their attorney’s letter to Media Borough dated September 29, 2017. Many club members who attended a Borough Workshop meeting expressed surprise at the club’s opposition to preserving this historic tract of land. A group has emerged in support of preserving open space in Media called Keep Media Green. Friends of Glen Providence Park supports the preservation of the BLCC property as open space. 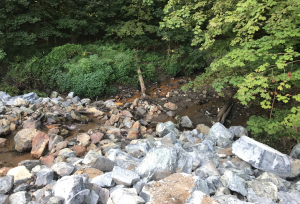 It will protect the vulnerable Ridley Creek Watershed, of which Broomall’s Run is a part, will help keep storm runoff and flooding more manageable within the park, and will help to mitigate the effects of development all around Glen Providence Park and Media Borough. You can find Keep Media Green on Facebook. Friends of Glen Providence Park continues to work with a community coalition that has made proposals to, and met with, Delaware County Council about a way to establish a pedestrian footbridge at the partially removed dam — we expect to have an update soon.